***Next meeting: May 9, 2019 at Wayside Saloon (1802 Crossroads Lane N., Freeport). ​Optional Social Hour/New Member Registration: 5:30-6:30pm. Cash bar. Complimentary appetizers provided by Wayside Saloon. We are a group of local women who are interested in supporting the local communities within Stephenson County. We come from all walks of life and varying financial backgrounds. As individuals we feel that it is challenging to individually make a meaningful impact on our community, but as a group we have the ability to contribute to the growth of our community in ways that we never thought possible! Our mission is to reach out and help our community by engaging 100+ women to each contribute $100 on a quarterly basis for a total of $40,000+ annually to local non-profit organizations. All organizations up for consideration are located within Stephenson County. The idea is to make a LOCAL impact. You want to way to give back with a low-time commitment. You want your donations to stay local. You are interested in building new relationships and having fun. Please feel free to attend any meeting as a guest. If, while you’re at the meeting, you’d like to donate to the selected organization please feel welcome to do so. We will also have member registration forms available at the meetings for anyone wishing to join us. 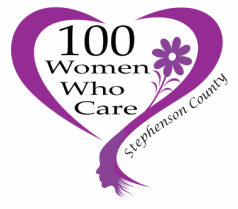 To join 100 Women Who Care-Stephenson County complete a ﻿Membership Form﻿ and return it via e-mail or bring it to the next meeting. To nominate a charity for consideration, complete a﻿﻿ ﻿﻿﻿Nomination Form﻿﻿﻿﻿﻿﻿﻿﻿﻿﻿﻿﻿﻿﻿﻿﻿﻿﻿﻿ and return it via e-mail no later than 2 days prior to the meeting. In order to nominate an organization you must be a member up-to-date with donations, be present at the meeting and be able to give the 5-minute presentation. If you have any difficulties opening these forms please feel free to e-mail us at ﻿﻿100WWCStephensonCounty@gmail.com﻿﻿.